The tall ships are coming! Join us Saturday, June 17, from 9AM to 1PM for the Grand Parade of Sail on Boston Harbor. The tall ships are racing from Bermuda to Boston in the latest leg of their 7,000-mile transatlantic regatta, and we have the best seats in the harbor! The fleet is expected to arrive off the Massachusetts coast on June 16 and will then participate in the 5-day Sail Boston festival. We will have theater-style seating on the north apron of the World Trade Center, one of the best vantage points to take in the parade. Food and drinks will be available for purchase. After the Parade of Sail, check out the ships for yourself! 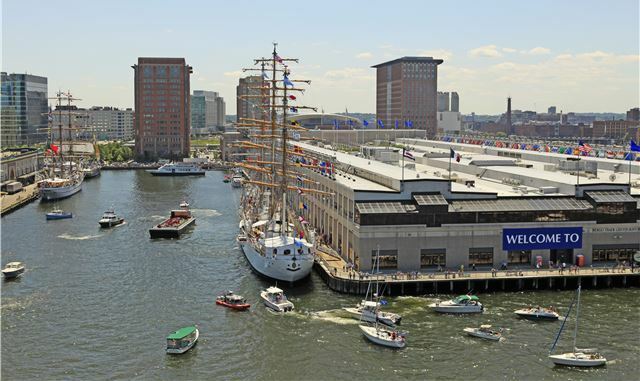 The tall ships will be berthed by the Boston Fish Pier and the World Trade Center for public boarding on June 17 from 4PM until 10PM and Sunday, June 18, from 10AM to 10PM. Channel your inner sailor, and join us for this sail-raising event!